IT’S a fight for pure drinking water. A basic human right. This is a benchmark global community issue. I have seen it first hand in Nepal, where there is an ongoing battle between China and India over clean water sources. Clean water is the new gold. 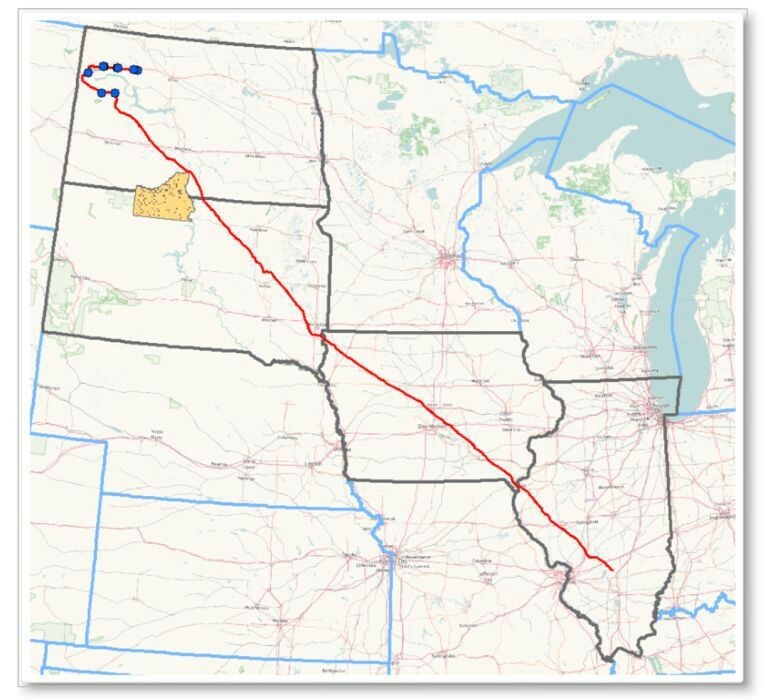 While in recent news it has been declared that the Dakota Access Pipeline will not go ahead — that is not quite true. The Trump administration has said that they will overturn the ruling of the federal government and the pipeline will go ahead when they are inaugurated on the 20th of January 2017. Guess what? Trump’s secretary, Rick Perry sits on the Dakota Access Pipeline’s Board involved with building the pipeline — how convenient! I had heard about the current situation while I was in Chicago at Standing Rock Reservation in North Dakota where thousands of protesters have gathered at the access camp to stop the oil pipeline that will cut through the Sioux lands and under Lake Ohae. I decided I had to go and I would travel 18 hours on a train to get to Standing Rock. I knew that New Zealand news crews had visited standing rock, like the archly-named Native Affairs. I was a one-woman band and I wanted to go and see it all for myself, and in particular, to meet the people. 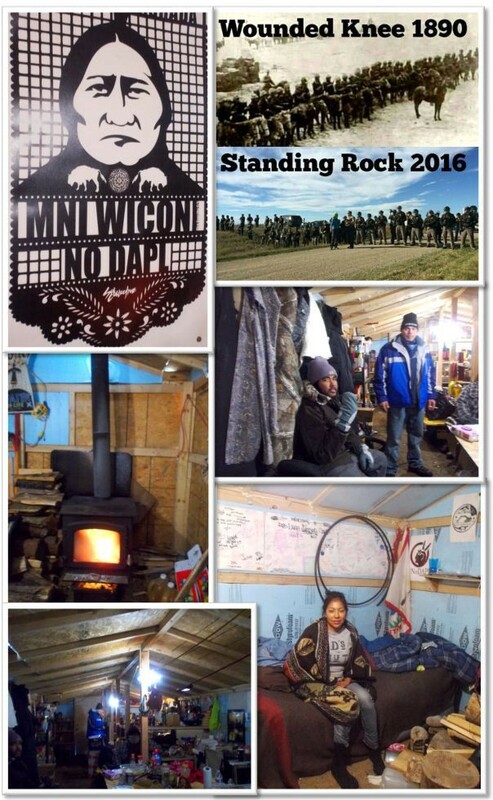 The Standing Rock group belongs to the Sioux tribe and runs through North Dakota and South Dakota states. It is home to the ethnic sub-groups of Hunkpapa Lakota, Sihasapa Lakota and Yanktonai Dakota. There are three main areas within the reservation: communities at Cannon Ball, Fort Yates and McLaughlin. I had recently been to Flint in Michigan where I was handed bottled water at my accommodation because of lead poisoning in the water systems. Most of the town’s 99,000 residents had got sick from the poisoning and I was told not to touch any of the tap water. This fuelled my fire to find out more about Standing Rock and to go there in support of their cause. Read more here. So I found myself sitting on a train for 18 hours from Chicago to a small town called Minot. 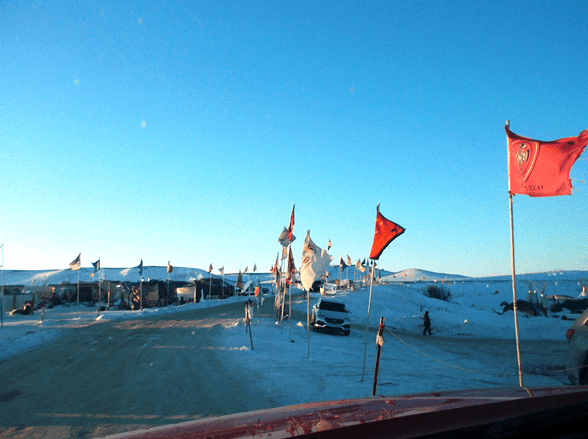 It would take me another 257 kilometres of driving through snow to get to the Standing Rock access camp. When I arrived it was a frigid minus 27 degrees. 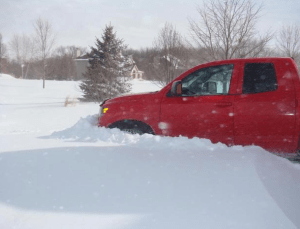 I got to Alamo car rentals and had to trudge with wet feet through a metre of snow to find my car. It turned out to be a monstrous truck. I stayed one night in Minot to practise driving such a big vehicle before I got out on the open roads. Minot was another town affected by oil. Once a tiny town, the population has tripled since 1992. 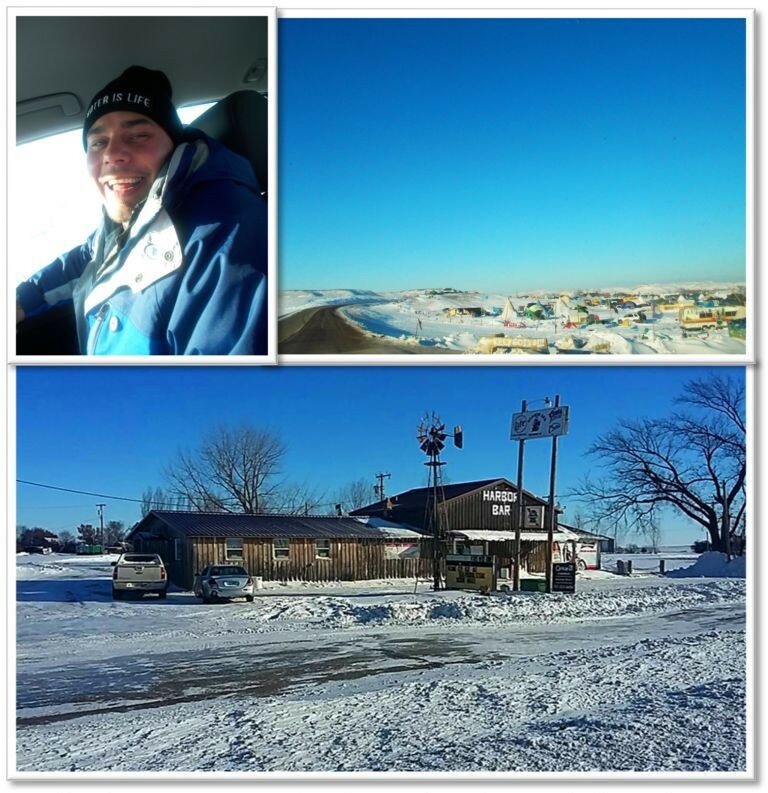 I drove from Minot to Bismarck, a halfway point to Standing Rock. Fort Yates in North Dakota was the camp I was aiming for. I arrived in Bismarck, a town with German roots, and found that the main highway had been closed by police. Bridges had been burned and the snow had also caused havoc on the roads. I was so close. I headed to a restaurant to figure out what to do next, when a young man approached me to use my phone. I let him and over heard that he had come from the exact camp I was planning on going to, and that he needed a ride back to the campsite. I offered to buy him lunch and then drive him there if he knew another way to go. His name was Ozzy, and as it turned out he was one of the frontline warriors. He was my navigator in getting to the camp on an alternative route along route 24 and 6 and then cutting through back-roads. 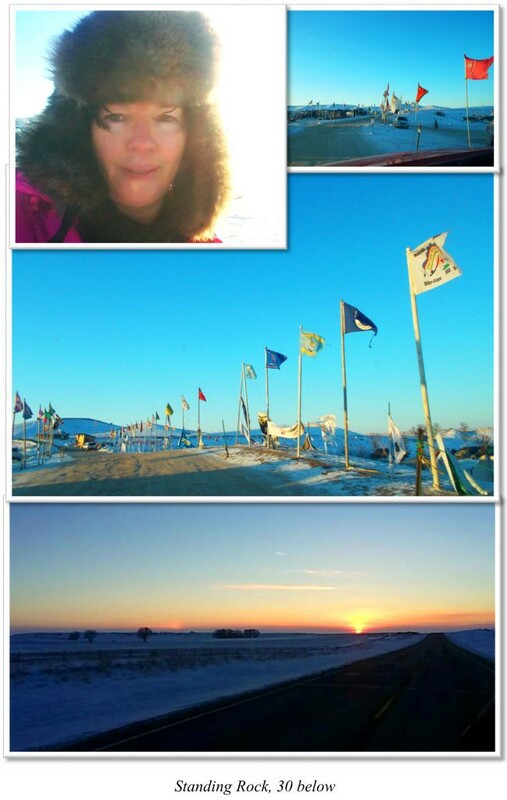 I arrived at the Standing Rock access camp, Oceti Sakowin, on a Thursday amidst a blizzard. It was freezing. Yet among all the snow lay tipis and tents. People who came to support the cause got free meals and, if it was available, free accommodation. The conditions were harsh. Because of rumours circulating that the pipeline has been stopped, people were leaving. It was so cold that I found it difficult to breathe, and that if I removed my gloves for more than two minutes I was in danger of getting frostbite. The toilets had been removed and people were using buckets instead. It wasn’t ideal. Ozzy and his friends were not convinced that the show was over. They had heard the Chief, David Archambault II, ask people to leave Standing Rock, but Ozzy and his friends wanted to remain there. Ozzy was from California but had left his job and gone to Fort Yates to show his support. He introduced me to his reservation family; among them were Sasha and Chad. Sasha told me she was from a tribe who had not signed the treaty and therefore did not feel she was part of the United States of America. Chad was recuperating from tear gas and it had damaged his lungs. The tepees that were set up were ideal for the harsh conditions but people who had brought ordinary tents found it was too difficult in the snow. I met a woman from British Columbia named Dilli, who was leaving because of the weather. People were leaving to stay in the Sioux-run casino, as another blizzard was forecast for the next day. I called the casino and they told me they were completely full and there was no accommodation left. The camp family told me about how other tribes had signed contracts for a significant amount of money in return for allowing pipelines to be built across their lands. A recent spill just two and half hours away from Standing Rock had leaked 176,000 gallons of oil into a local creek. This was a spill from the Belle Fourche Pipeline in Billings County. This was the issue animating the protestors: basically, that the pipelines were going to contaminate all the local groundwater. The Belle Fourche pipeline has reported ten spills since 2011, and the recent spill had reignited the fears the Standing Rock protesters had. I didn’t get to meet the Chief, or LaDonna Tamakawastewin Allard, prominent leaders in the protests: although I have seen their inspiring posts on Facebook. “ All I know is we stand against this black snake we stand to protect the water we stand together as a people who can change the world..” — LaDonna Tamakawastewin Allard, Facebook, 14 December 2016. I witnessed a cleansing ceremony while I was there. I felt out of place. I am Scottish and we have lost our own language, so who was I to be there to support these people? There was an increasing presence of police and law enforcement around the areas — barring access to the reservation in some areas. In a letter, David Archambault II, the chief or more formally, these days, the chairman of the Sioux Reservation, wrote that “Local and state law enforcement have increasingly taken steps to militarize their presence, to intimidate participants who are lawfully expressing their views, and to escalate tensions and promote fear.” The increase in law enforcement is making the supporters uneasy and inclined to question why, when everything should be winding down. 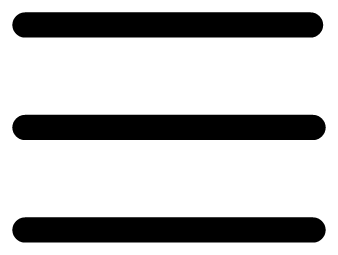 There were rumours of all sorts of things circling around camp, making things feel very tense. I offered food donations and in turn they offered me a place to stay. I thanked them but I said I would help in other ways. I offered to send them a Dictaphone so they could record their stories. There were reports circulating that the company was still drilling, despite the latest news that the federal government had declined the building of the pipeline. Chad told me he believed humanity is doomed without clean safe drinking water. He said he would die fighting for it. On my way back to Chicago on the train I met a paramedic-firefighter, Paul, who had helped in building a makeshift hospital. He said while people were leaving they were preparing to return in January when the Trump government was inaugurated. I take my hat off to them all. Polluting water is madness and I agree completely with Ozzy, Chad, Sasha and all the other protesters at Standing Rock — it’s just common sense that humanity has clean drinking water. It’s an issue that is bigger than humanity, the environment and animals depend on it too.